Best of the Midwest Awards: Winners Announced! From St. Paul to Springfield, Sheboygan (Wis.) to Cheboygan (Mich.), Chicago to Columbus, we’ve heard you. Your voices — and your votes — have been resoundingly clear in the first-ever Best of the Midwest Awards, where our readers helped us find the greatest golf in the Great Lakes. You love golf in the Midwest as much as we do. So here, without further adieu, are the winners of the first-ever Best of the Midwest Awards! Thanks to all of you who voted, and congratulations to our winners! Congratulations to our heavyweight champion of the Midwest, Whistling Straits, the Pete Dye-designed masterpiece on the sunrise side of Lake Michigan. With craggy cliffs, blackface sheep, a couple of Majors and the 2020 Ryder Cup on its resume, it’s tough to top this incredible course. 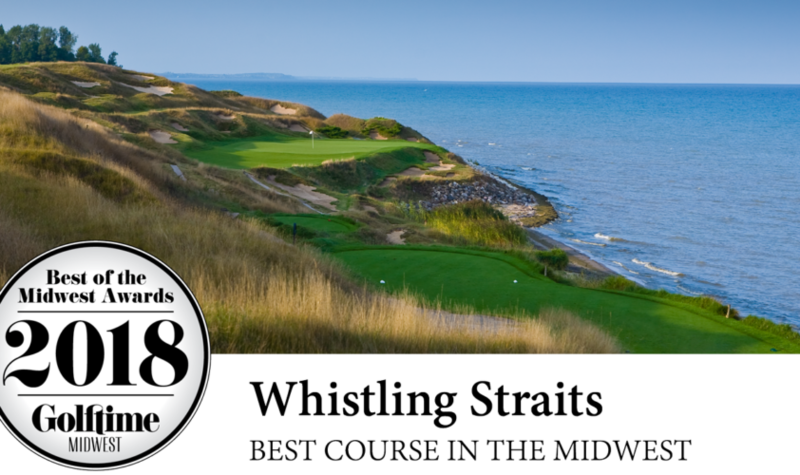 The Straits beat serious contenders in Arcadia Bluffs, Forest Dunes, and the Dye Course at French Lick Resort. It also withstood a challenge by the Rick Smith Signature Golf Course at Treetops Resort, which cleaned up big in the awards this year. But anyone who has visited the Straits at Kohler’s sublime American Club knows it’s truly as close to golf royalty as we will find in the Midwest, and the perfect course to wear the crown as Best Overall. Naturally, the Straits also won Best in Wisconsin, handily topping Erin Hills and Sand Valley, the terrific twosome of young upstarts on the upscale Wisconsin golf scene. We expect this trio of terrific courses to be a mainstay on the awards scene for years to come, and they remain a must-play on any golfer’s list in the Great Lakes. Cog Hill No. 4 (Dubsdread), Lemont, Ill.
Fittingly, the fan-favorite course in Illinois comes from the club credited with bringing the “country club experience” to the masses: Cog Hill. Founder Joe Jemsek’s crown jewel, Dubsdread, has been a beloved staple in the Midwest golf lineup, and edged PGA Tour stop Deere Run and Eagle Ridge Resort’s The General. The Dye Course at French Lick Resort, French Lick, Ind. In what could be Pete Dye’s most visually stunning masterpiece, The Dye Course at French Lick offers incredible views and challenging play across a veritable moonscape of Indiana’s highest hillsides. 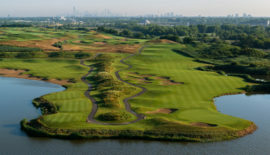 The Dye Course topped worthy contenders Purgatory Golf Club and Dye’s own Kampen Course at Purdue. And as the sponsor of this year’s awards, one lucky voter wins a weekend getaway at French Lick. 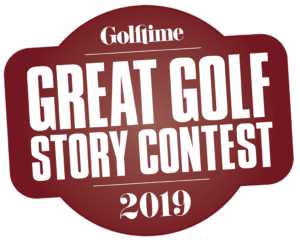 Pick up the Summer Edition of Golftime Magazine to find out who won! The Rick Smith Signature Course at Treetops Resort, Gaylord, Mich. In a surprising upset, Treetops Resort’s stellar Rick Smith Signature course topped another of Rick Smith’s (co) projects, Arcadia Bluffs. Treetops is one of the most popular destinations in the Midwest, and the outpouring of love for the Signature course was unbeatable. Another fan favorite, Forest Dunes, also made a strong showing in this year’s voting. Wilderness at Fortune Bay, Tower, Minn.
It’s wild. It’s wooly. It’s the quintessential North Country golf experience. It’s the Wilderness at Fortune Bay, and it’s the winner of Best Course in Minnesota. Carved through the towering pines of Tower, Minn., Wilderness topped the terrific twins of the Quarry Course and Legends Course at Giants Ridge. Sand Valley Golf Resort, Nekoosa, Wis. 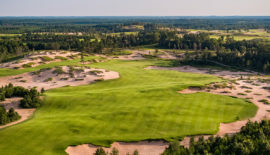 In the closest voting of our awards, the Bill Coore/Ben Crenshaw-designed Sand Valley narrowly squeaked by the Tom Doak-designed The Loop at Forest Dunes. Sand Valley is set in a veritable desert of dunes, buried for thousands of years under glacial Lake Wisconsin and pine forests. The wait was clearly worth it. The Loop is really two courses in one, the Black and the Red, as the world’s only reversible golf course. Sure, it doesn’t have beaches or big cities nearby, like some of the other getaways in the Midwest. But what the glorious golf Mecca called Gaylord, Michigan, has in spades, friends, is fantastic, affordable golf, four terrific resorts, and gorgeous, get-away-from-it-all landscape. 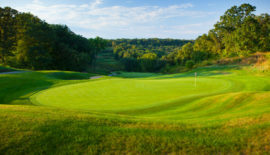 Gaylord’s 15 fine courses in the Mecca offer big-name architects and lower prices than you’d expect, helping it edge out Kohler and its Northern Michigan cousin, Traverse City, as the fan-favorite golf destination. When it comes to making easy destination decisions, Gaylord is simply a gimme. Five fantastic courses by Rick Smith, Robert Trent Jones, Sr., and Tom Fazio. Unlimited stay-and-play golf packages starting at $99 (!). That’s part of what has made Treetops the tops on so many summer checklists. As the crown jewel in America’s Summer Golf Capital, Treetops wins with quantity, quality, and affordability. Forest Dunes and Lawsonia also garnered votes. The Straits Course No. 17, Kohler, Wis.
What makes the best par 3 in the Midwest? Craggy cliffs down to a raging shoreline? Check. Howling wind whipping your ball into the wide blue yonder? Check. “Dye”-abolical bunkering? You know it. Welcome to Whistling Strait’s stunning 17th, the 249-yard “Pinched Nerve,” which topped Arcadia Bluffs’ 13th and the 17th at Giants Ridge, among others. Forest Dunes No. 17, Roscommon, Mich.
Tom Weiskopf has built plenty of amazing holes over the years, but his fantastic, 302-yard par 4 17th might be his very best — and thanks to our voters, it’s named Best Par 4 in the Midwest. At just 302 yards from the tips (yet surrounded by grassy, inescapable dunesland), it beckons like a siren for you to blast it with all your might. It might just break your heart instead. Arcadia Bluffs No. 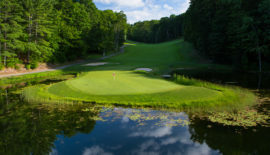 11, Arcadia, Mich.
It’s one of the most picture-perfect par 5s on the planet, a 633-yard downhill stunner, culminating in a cliffside green that drops off into the wide blue of Lake Michigan. It’s also your winner as the Best Par 5 in the Midwest, and we couldn’t agree more. Great service is something so hard to describe, but so easy to spot when you see it. It’s an intangible element that makes good golf courses great, and great golf courses Forest Dunes. Friendly, helpful, intuitive, and genuine are just a few ways to describe the people working here, which makes Forest Dunes a special experience in a special place. Legends on the Hill, Treetops, Gaylord, Mich.
What are the three most important things for a great lunch at the turn? Taste, time, and price. Legends on the Hill at Treetops hits the mark in all three, and adds unlimited views from the top of the ski hill as an appetizer! The restaurants at Wilderness at Fortune Bay and the Dye Course at French Lick Resort also made readers’ mouths water. In the most perfect finish possible for our first Best of the Midwest Awards, two incredible courses tied for Best 19th Hole, for very different reasons! Forest Dunes’ 19th hole is actually that — a 117-yard par-3 bet-setter — that’s the golf equivalent of the mint on your pillow. Genius. Arcadia’s 19th hole, on the other hand, is simply the best place to have a post-round drink in the Midwest. Imagine sipping a cold beverage in an Adirondack chair on the patio, clapping for the groups coming in, and watching the setting sun dip into Lake Michigan as the bagpiper plays from high on the hill. Magic. For more about the Best of the Midwest Awards, including our prize winners, pick up the Summer Edition of Golftime Magazine, out soon! For the complete Rules, please click here.